A Guide to Effective Practice. Composed by Georg Klutsch. Sheet music. Edition Schott. Instruction, Contemporary, Classical. Softcover. 72 pages. Schott Music #ED9567. Published by Schott Music (HL.49008447). Concentration on individual aspects of playing the bassoon will make it easier to identify and correct errors and imprecision. 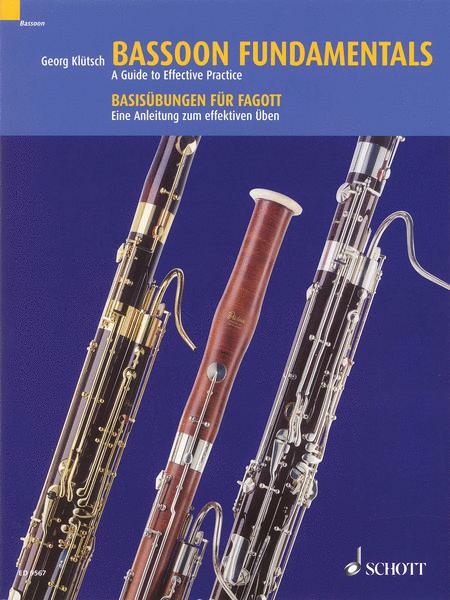 By working steadily through these exercises you can acquire a basic technique that will enable you to tackle difficult passages in the bassoon repertoire. Such meticulous attention to detail will help you achieve the freedom to follow your intuition in a spontaneous musical performance. Georg Klütsch, b. 1951 in Düren, trained as a music teacher in Mainz and studied the bassoon with Prof. Helman Jung in Detmold. For many years he was principal bassoonist with the Bamberg Symphony Orchestra and a member of the Sabine Meyer Wind Ensemble. He was professor at the Franz Liszt Music Academy in Weimar. Since 2001 he has been professor of bassoon and chamber music at the Cologne Academy of Music, also teaching international master classes. 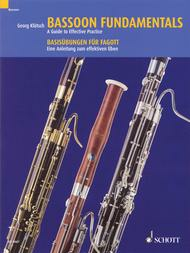 Aims of this book • Tone quality • Finger technique • Articulation • The upper register • Trills • Intonation • Studies based on scales and arpeggios.